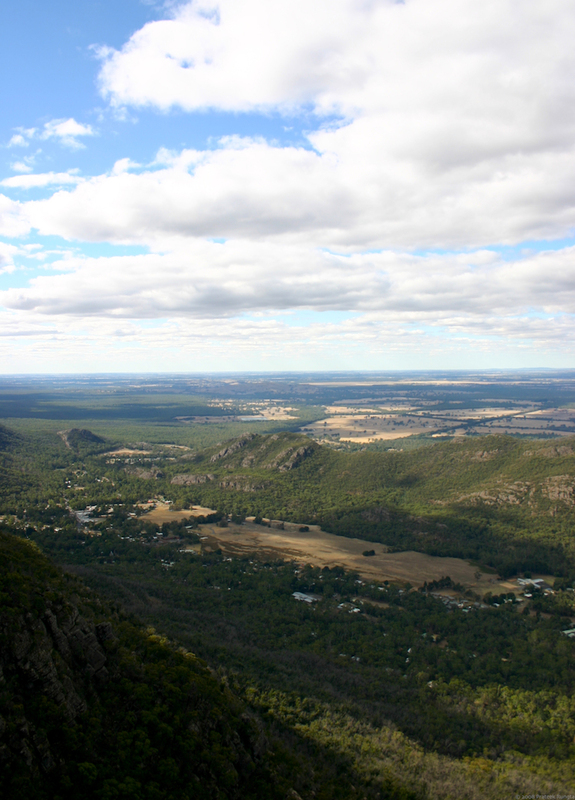 The Grampians as seen from the Pinnacle. Went there during my mid–semester break. The place is a hiker’s heaven, and it was too bad that we were there only for a couple of hours. I guess that’s good excuse for another trip ;). Unfortunately, I screwed up most of the photos I took during the trip, so you’ll have to trust me when I say that its a great wilderness with everything that you’d expect from a great wilderness – forests, wildlife, rock formations, mountains and history. Move your mouse over the panorama below for a wider view, or check out a bigger version of the panorama (and a smaller version of the photo above) on flickr. Absolutely. I’m definitely going down to New Zealand some day. There’s even a tour which takes you around all the LotR locations. Just waiting for the right time and the right people to tour with. Great job with the panorama, it looks amazing! Nice shot. And I really like the way you create different animation for different blogposts. Sheesh, the clouds remind me of Windows 98. Bad days, those. Really really awesome! The panoramic view is really wonderful. Almost feels like you could touch the sky and it sure reminds one of LotRs. Wish that when the right time comes for you to travel to NZ, its the right time for me to join you too!! well this place surely seems like a place you should visit again with time at hand. Wish that when the right time comes for you to travel to NZ, its the right time for me to join you too!! That’d be awesome, no doubt. Let’s hope Ooty happens this December first.